inLighten® maintains and operates the largest digital signage network and is the leading provider of digital media solutions. inLighten's content creation, management and distribution software, and digital media players offer users the most affordable, easy-to-use and complete digital signage system on the market today. inLighten digital media solutions also consist of interactive kiosks, audio networks, speech privacy and web-powered printing. inLighten client services include specialized content, media design, consulting, project management and installation, training, network operations and 24/7 technical support. 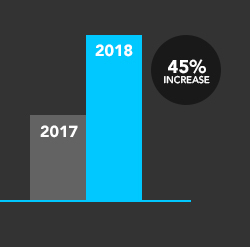 During 2019, the number of institutions switching to inLighten digital signage grew by 45%. Why did clients state they made the change? inLighten has compiled client-based research collected during a series of bank branch intercept studies performed 4 months after installation to determine the effectiveness of inLighten’s digital signage merchandising and communication solutions. The research measured Viewership Development success when utilizing inLighten iTV™ news programming integrated with client ads, Viewer Ad Recall, Service Quality Performance and Sales Activity. The research showed that viewership penetration, when client messages were combined with inLighten’s iTV news programming, grew to 98.1% after four months. 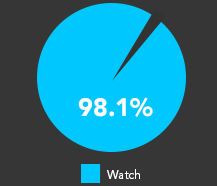 Over 60% of viewers indicated that they spend nearly all their time watching the program – and some 88% said they spend more than half their time in the office watching. inLighten Methodology: inLighten delivers superior viewer participation by employing a proprietary formula for news and information programming that includes demographic and behavioral modeling, world-class news sources, industry-sensitive filtering and rigorous editorial oversight. The research showed that the high level of viewership occurred not only with news content but translated to an 89.5% Ad Recall rate among viewers. 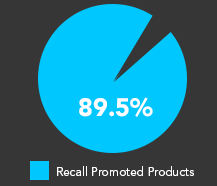 Over 50% said they recalled three or more unique products (announcements) and 83% indicated they recalled two or more. inLighten Methodology: inLighten applies a proprietary blending algorithm to combine client content with inLighten’s specialized iTV news programming in a way that maximizes viewer exposure on each visit and powerfully ingrains client messages across multiple visits. 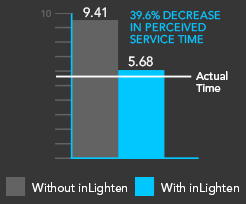 The research showed that viewers on average believed that service speed was 39.6% faster than before the inLighten digital signage solution was implemented. inLighten Methodology: When high-value news and information is perfectly integrated with client messages in a seamless programming mix, it becomes an expected part of the viewer’s experience on every visit – replacing judgments about service speed or efficiency and creating a perception of improved service quality. 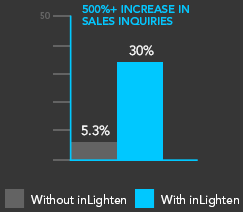 The research showed that five times the number of branch customers made product and service inquiries (30% vs 5.3%) than before inLighten digital signage was installed. inLighten Methodology: When a proven methodology for viewership development built around specialized, high-quality news and information programming is combined with a highly-effective model for maximizing message exposure, viewers become both better informed about current offers and more comfortable with their visit, resulting in a dramatically increased willingness to extend their visit and ask about products and services that can help solve their problems, manage their lives and work toward achieving their dreams.